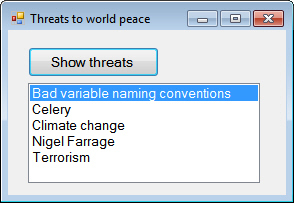 Here we've used a list box to hold the imported threats, sorted into alphabetical order, but it doesn't matter how you choose to display the information. When you've got this working, you could spend an idle moment wondering how you would change this list to make it more realistic. For example, should beetroot be on the list too?